One of our favorite sports apps for BlackBerry, Endomondo, has hit a milestone today. The company has announced that they have made it to 10 million users that combined have logged over 320 million miles with the app. If you haven't heard of it before, Endomondo is a sports tracker app that lets you easily keep track of your running, cycling, boating etc. from your mobile device. You can track your fitness goals and even get audio feedback during your workout. 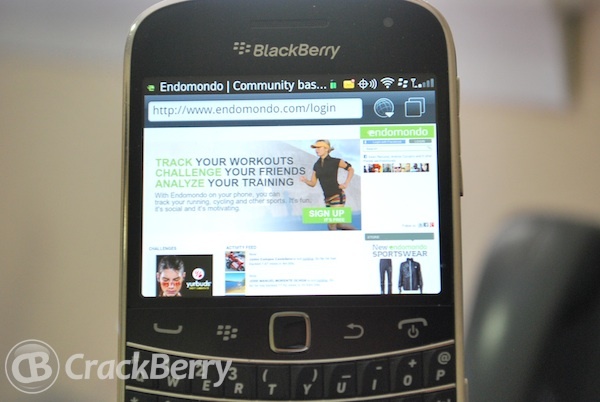 Be sure to check out Endomondo in BlackBerry App World and keep reading for the full press release. SAN FRANCISCO, CA - June 27, 2012 - The Endomondo Sports Tracker mobile fitness app has reached the 10 million user mark, tripling the number of adoptees in less than a year while remaining the most highly rated fitness app across multiple mobile platforms. To celebrate, Endomondo will be offering the PRO version of its app for only $1 from June 27 to July 1. Statistics show that almost a quarter of Endomondo's users are located in the Unites States. Great Britain and Spain follow with 10 percent each. The rest of Europe makes up 35 percent of Endomondo's users. Also of note is the fact there has been an 8 percentage point increase in usage over the last year by females. Currently, 75 percent of Endomondo's users are men and 25 percent are women. Mette Lykke, co-founder of Endomondo, said the ever increasing adoption of the company's mobile app can partly be attributed to the social nature of the service. She said a perfect example of this is the fact that since launching its Facebook Timeline capability earlier in 2012, Endomondo has seen traffic from Facebook increase by more than 150 percent and around 50,000 workouts are now shared daily on Facebook. "Our mission is to make fitness fun by making it more social and more engaging," Lykke said. "Most of our users find it motivating to connect with friends, family and co-workers around fitness. Users can give pep talks to one another, comment on each others' workouts and challenge each other. The fact that our service becomes more motivating with the more friends you've got is a key driver for Endomondo's growth rate which is currently at more than 20,000 new users per day." The Endomondo Sports Tracker is a free mobile app that turns GPS-enabled smartphones into a personal trainer and social motivator capable of tracking workouts, analyzing performance, and aids in the discovery of activities and insights into fitness. Endomondo stands apart from other activity tracking apps in its focus on the social dimension to fitness. By incorporating unique social aspects, Endomondo connects fitness fans locally and around the globe. Users can send friends real-time pep talks while they exercise, compete virtually against friends for fun, and share it all on Facebook, Twitter or across the Endomondo social network. Endomondo is backed by Denmark's SEED Capital and a handful of private investors. The company has raised $6.2 million to date. For more information, please visit http://www.endomondo.com and follow Endomondo on Facebook.